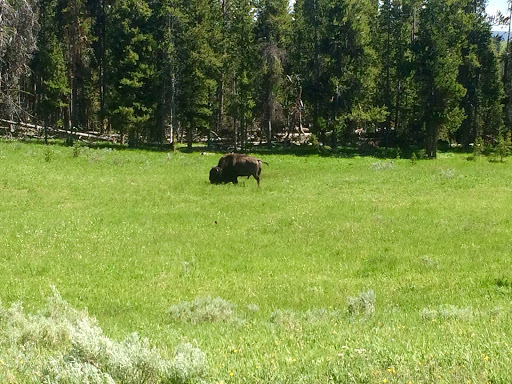 Dear Mother Nature, thank you for all that is Wyoming and it’s beauty! Before this trip, I had not been to Wyoming at all. I had high expectations for it’s beauty, and Wyoming did not disappoint. 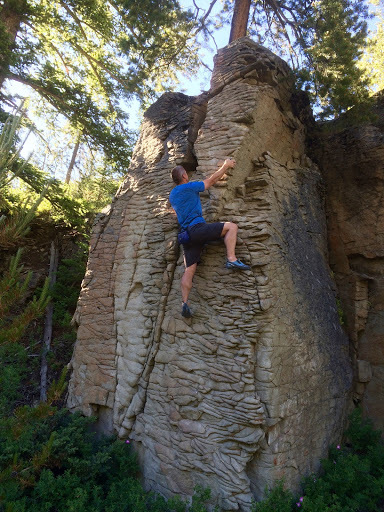 The primary reason the Husband and I traveled there was to rock climb. 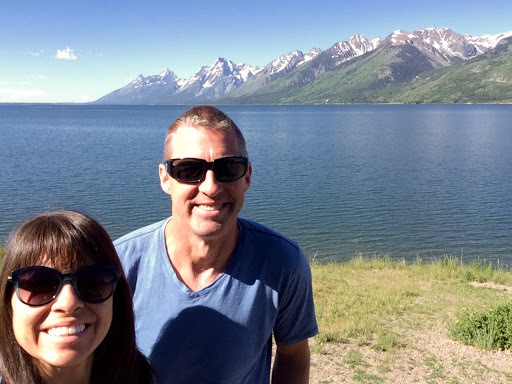 The first part of our trip included flying into Jackson, driving through Teton National Park, and then seeing the geysers of Yellowstone National Park before finally ending up in Ten Sleep. Find your park! 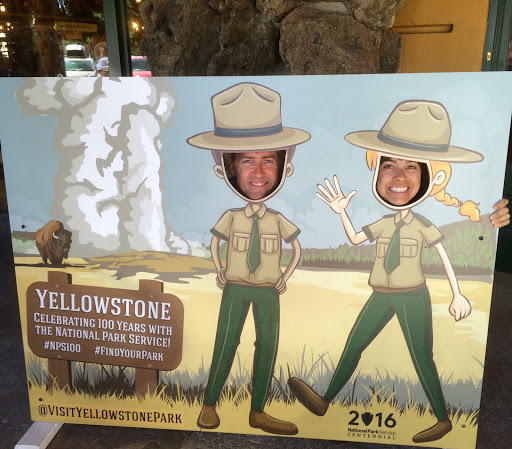 The National Park Service agency celebrates 100 years, Yellowstone being the first park dedicated over 144 years ago, thanks to President Grant and naturalist Ferdinand Hayden. 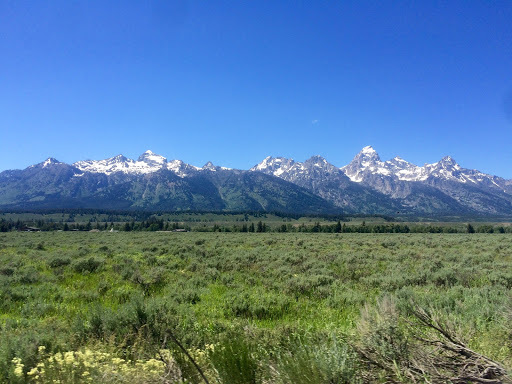 The beautiful Tetons as seen from driving north from Jackson, toward Teton National Park. 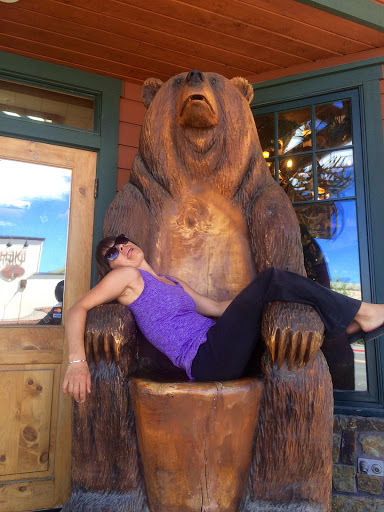 Welcome to Jackson Wyoming. 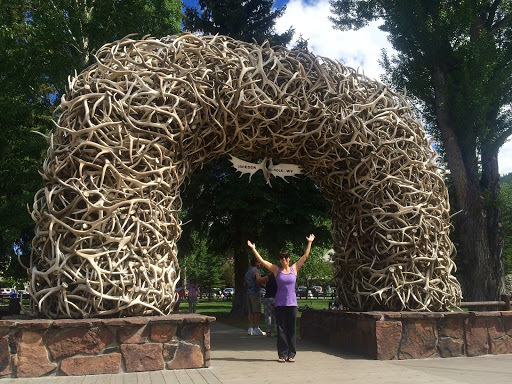 The Town Square park has an antler arch on each corner. What doesn’t kill you will make you stronger. Except bears. Bears will kill you. Skip Starbucks, visit local Cowboy Coffee Cafe. 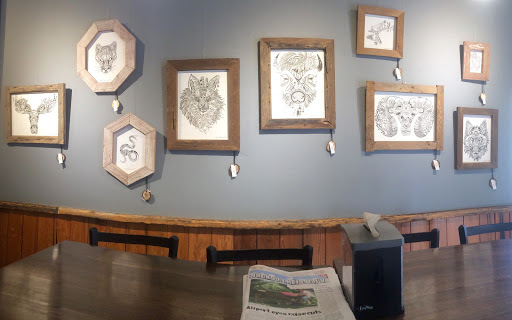 Delicious lattes, and an assortment of local baked goods as well as breakfast and lunch items. 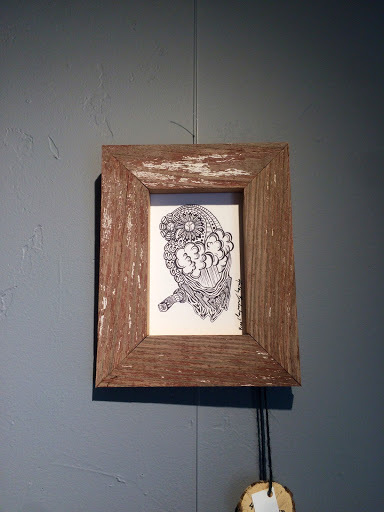 The art on the walls is for sale. Jackson Lake, on the north end, with the Teton range on the left. In the park there are numerous lakes of varying sizes, historic early settler sites, and a string of trails to hike (from beginner to advanced). 15 miles long, this lake also has 15 islands, and was made larger by a dam to serve as a reservoir. The road past the lake continues on into Yellowstone through the John D. Rockefeller, Jr. Memorial Parkway. A connecting corridor of 24,000 acres purchased by Rockefeller then donated. 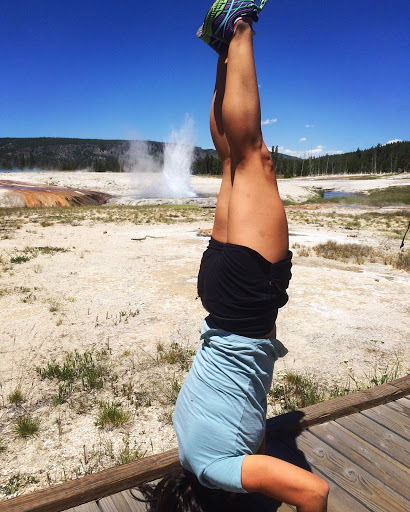 There is so much to enjoy in Yellowstone. We only spent ONE day driving through the park. You could easily spend 2 weeks exploring all the treasures. As you approach from the south you cross the Great Continental Divide 3 times. 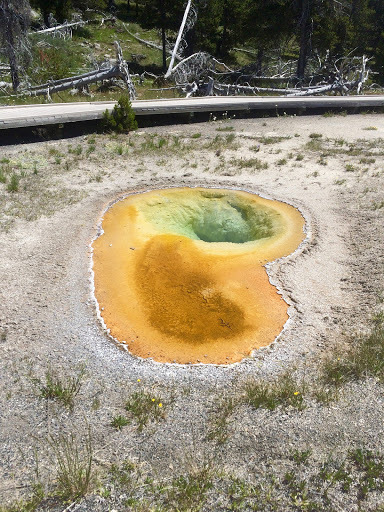 West Thumb Geyser Basin is very accessible, and boasts some spectacular colors and geysers. 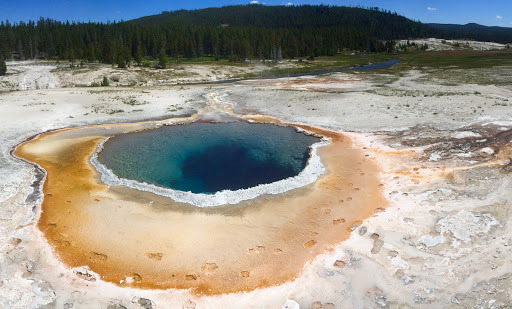 It’s also less crowded than the Upper Geyser Basin area where Old Faithful and the largest concentration of thermal activity in the park can be found. 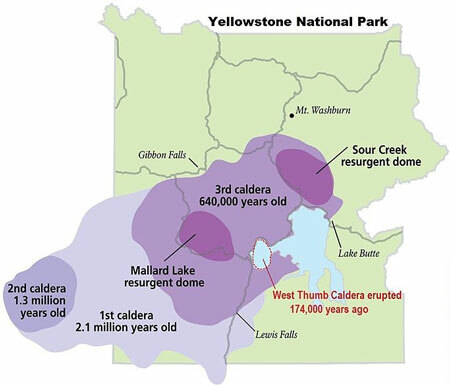 Once a super volcano erupting over the past 2.1 million years, the last of the 3 super eruptions 630,000 years ago created the Yellowstone Caldera, which accounts for all the major geothermal activity around Old Faithful. 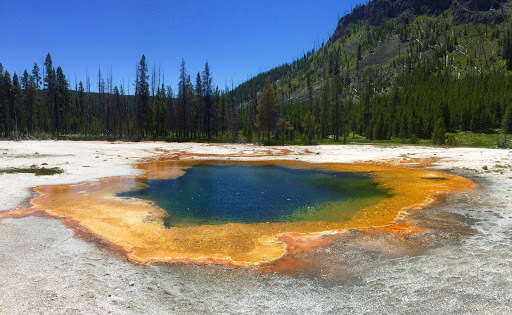 I enjoyed seeing the historic and world famous geyser, but equally impressive were some of the off the path geysers and pools. Wear sunscreen, bring a hat, and take water. Nerd alert: I read almost every sign, and absorbed details from the interactive education center. 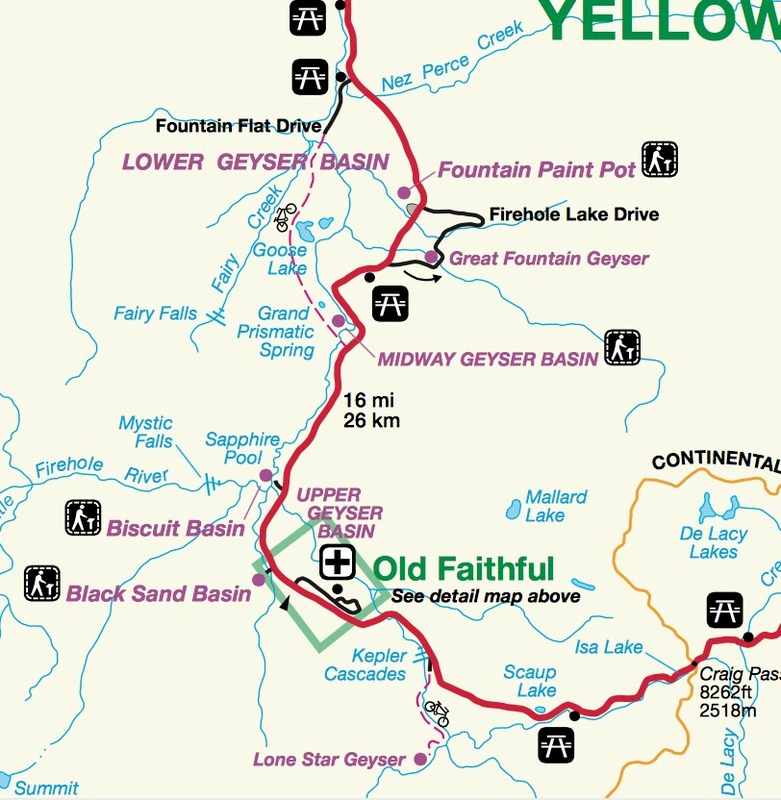 I also found many details from the Yellowstone park website, including this map. Waiting for Old Faithful. 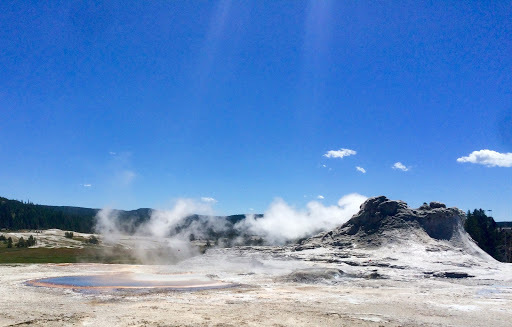 A cone geyser, with a margin of 10 minutes for eruptions. It will erupt 65 minutes after an eruption lasting less than 2.5 minutes, or 91 minutes after an eruption lasting more than 2.5 minutes. I hear the view from Geyser Hill is astounding, and only a short walk. 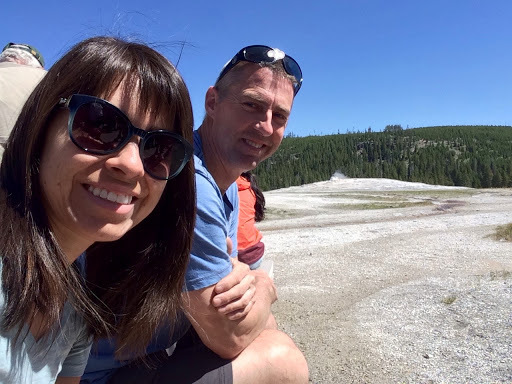 The most predictable geographical feature on earth, Old Faithful shoots boiling hot water up to 185 feet into the air. Steamboat Geyser (which is highly unpredictable, claims the tallest and largest geyser title in the park and world). 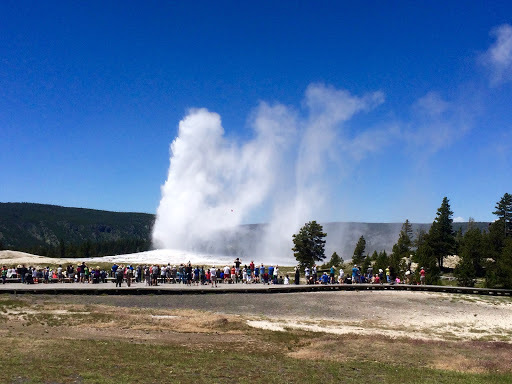 Check out the streaming web cam page for Old Faithful. We drove in about 20 minutes before the eruption, walked through the O.F. visitor center/museum, and waited just shy of 4 extra minutes late for the water works to begin. 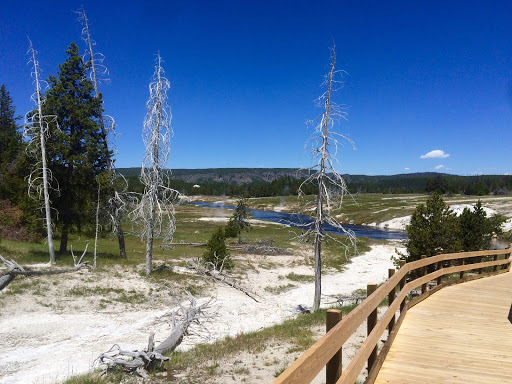 The boardwalks snaking through the Old Faithful area and Upper Geyser Basin pack in at least 150 geysers in just one square mile. 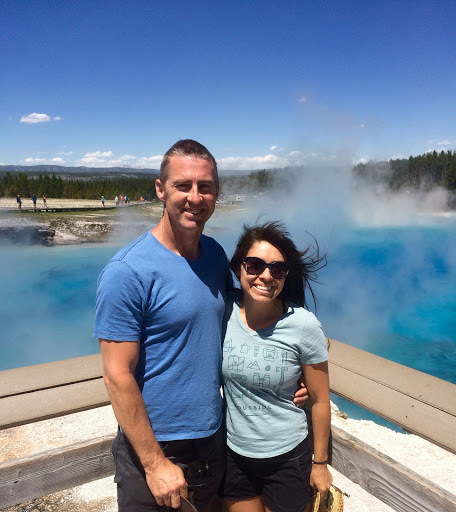 We saw some riding their bikes between the Old Faithful area, and the Black Sand Basin. Easily accessible for walkers (don’t forget it’s a mile) and cars on the main road. 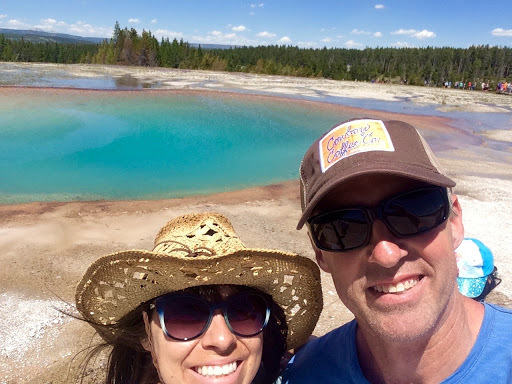 I recommend Black Sand Basin, and of course Midway Geyser Basin, which holds the famously colored Grand Prismatic Spring. I hope the pictures below impress. Decades ago, many of the famous pool colors were more vibrant. Due to trash and coins blocking some of the vents water temps have cooled changing the bacteria and thus the colors. 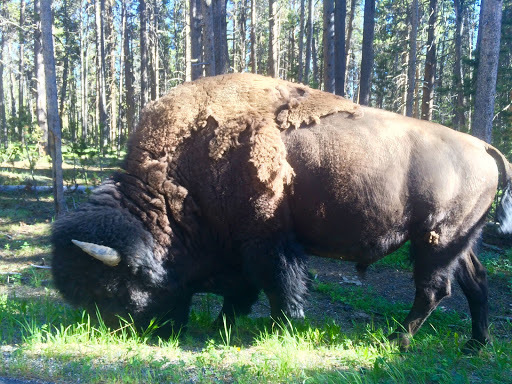 Please be responsible park visitors! Map of the grand loop tour of geysers. 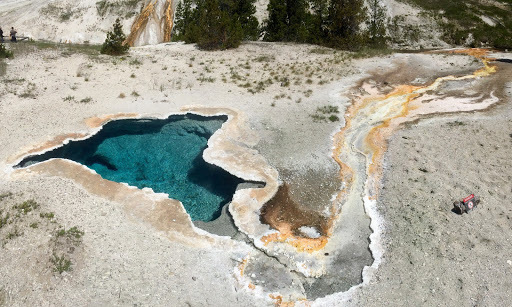 Castle Geyser is the cone geyser on the right (about 1,022 years old), and Tortoise Shell Spring is to the left. 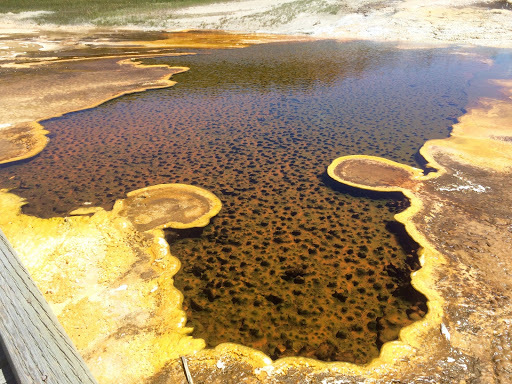 Sulfur and other noxious chemicals seep into the surrounding soil through the water run off. When trees in the area die and dry out they leave behind these ghostly looking sticks (years of sulfur intake through their root system). 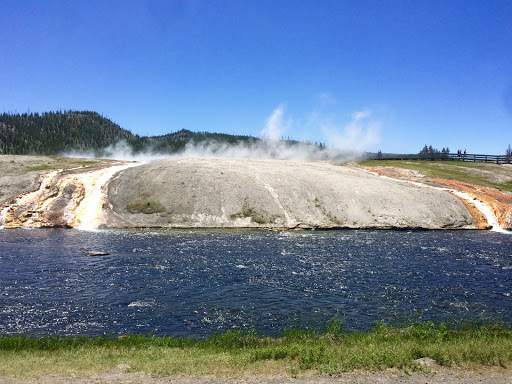 This geyser erupts almost continuously and even sprays the deck as you pass. Don’t worry, it’s not boiling water by the time it reaches you. 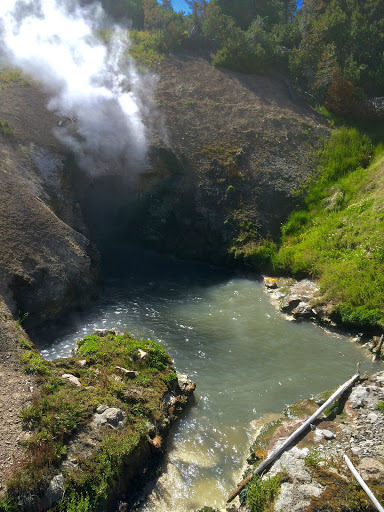 There are many bubbling geysers in this area just past Castle. I managed to miss this pool’s name. Wave Spring. 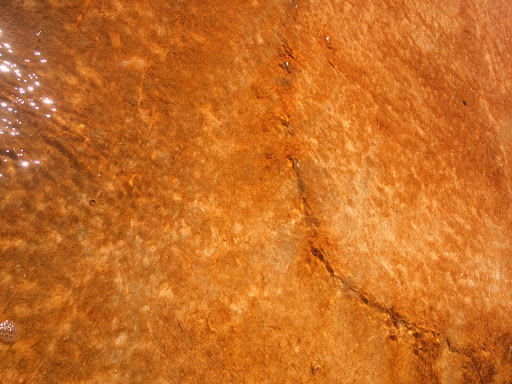 The bacteria mat (the orange color) has broken and shifted. These mats are VERY delicate and there are signs everyone reminding you NOT TO TOUCH or mark them. 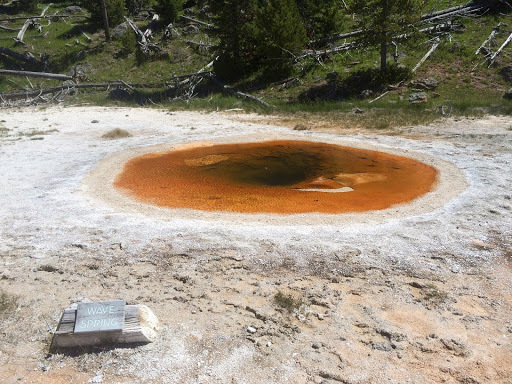 Beauty Pool was one of the first multi colored sights we came across. 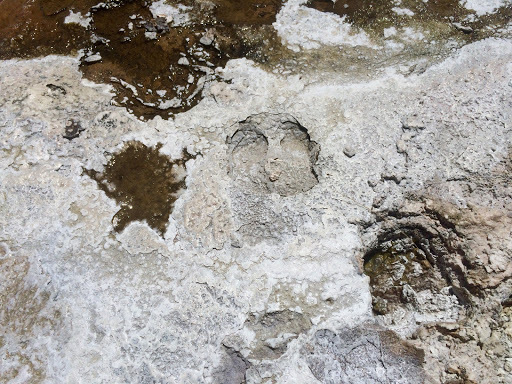 Keep walking and the pools get ever more breathtaking. Also note the bacteria mat breakage. 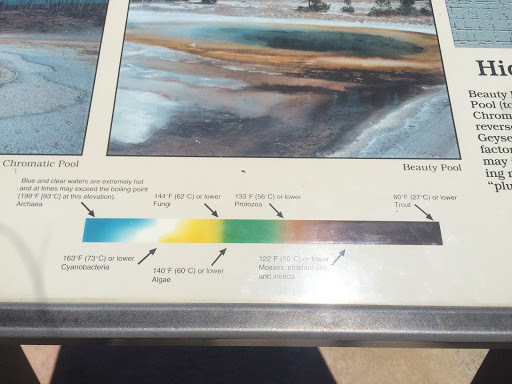 The color of the bacteria is a visual indicator of how hot the water is for a particular pool. 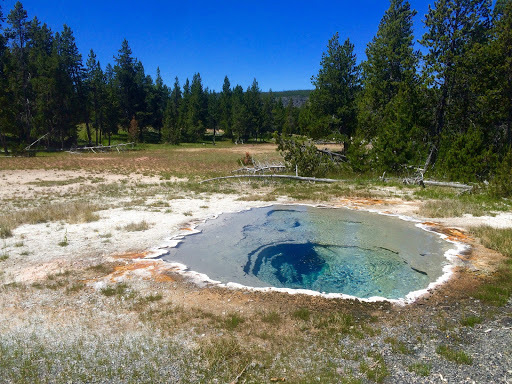 The blue pools are some of the most astounding to view, between 199 to 163ish degrees. One of the most beautiful bacteria mats that we encountered. Animals? Clove and foot (bottom middle a shoe print is visible). STAY ON THE PATH! 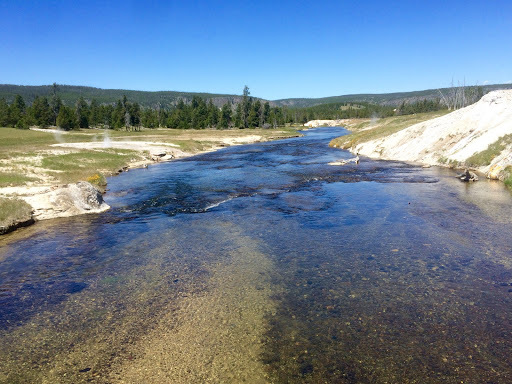 Run off from Midway Geyser Basin into Firehole River. Opal Pool selfie! A bit windy so please take care of your hats. 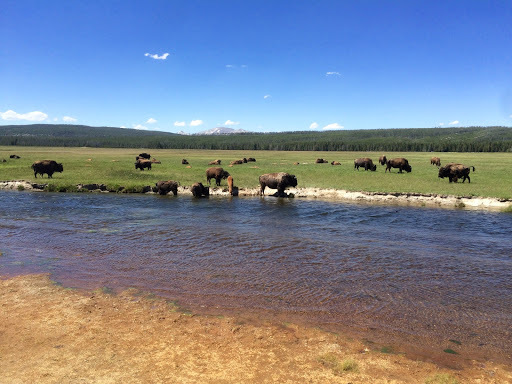 We saw many that needed to be fished out by the Park Service. THE MOST BEAUTIFUL BLUE I HAVE EVER SEEN!!! 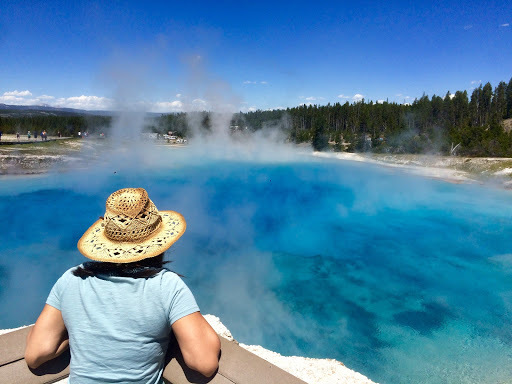 Turquoise Pool, a must see, almost more spectacular than Grand Prismatic because of the deck overlook. 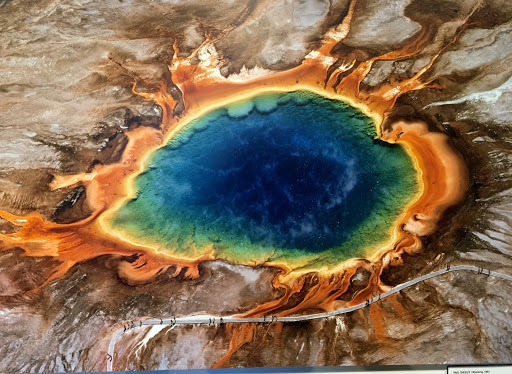 Grand Prismatic Spring, largest in the US, and third in the world. My photo atop my husband’s shoulders, standing on top of a bench seat. Not nearly as iconic as this National Geographic photo we saw later in the Washakie museum, Worland, Wyoming. 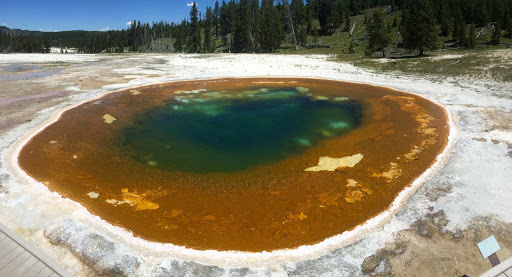 The center is approximately 121 feet deep and sterile due to the high heat. Grand Prismatic bacteria mat near the deck. 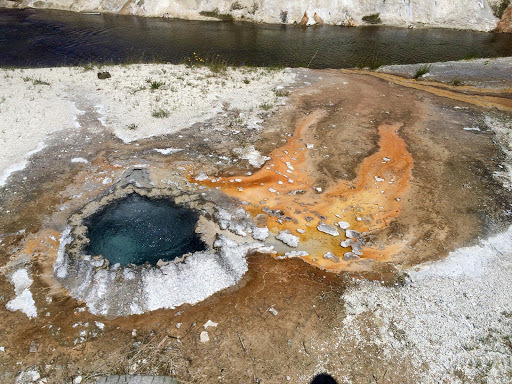 Just north of all this thermal activity is Madison junction. From there we headed to Norris where there is even more to see. 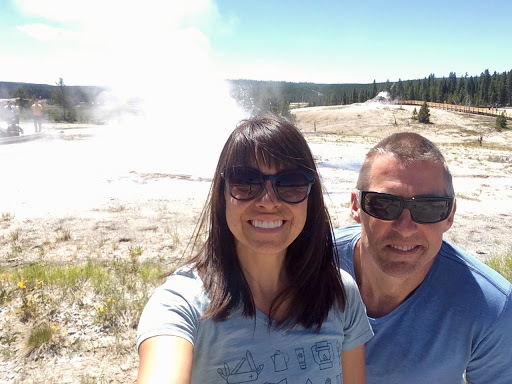 Looking back I wish we had stopped at Norris Geyser Basin, as it boasts the hottest, tallest and oldest geyser. 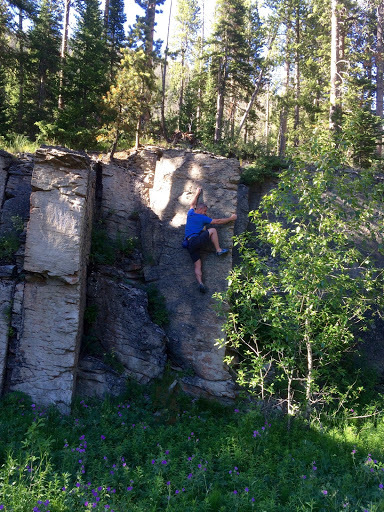 We did take a look at Gibbon Falls, just past Madison, and Beryl Springs by the roadside. 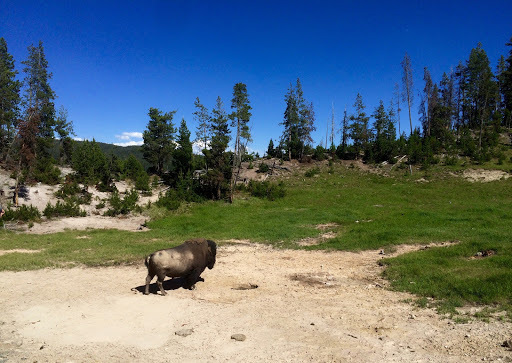 Away from the crowds of people through the major basin areas, the Buffalo roam comfortably. 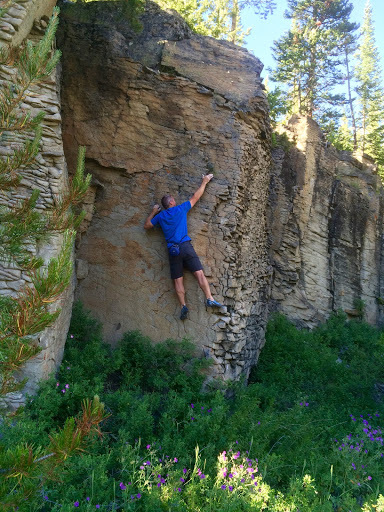 … and then this dude was hanging by the roadside! Past Norris on our way to Canyon Village there is a small cascading water fall. 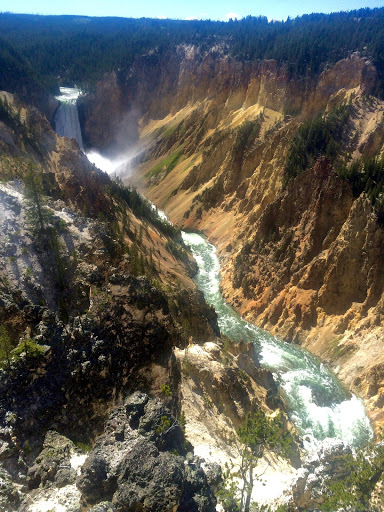 The Yellowstone River cuts deep through this area and is known as the Yellowstone Grand Canyon. 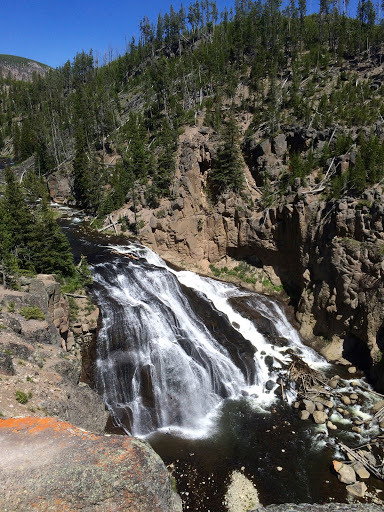 Here we observe the river and fall from the Upper Falls View off South Rim Drive. Another spectacular view would be from the other side, off North Rim Drive. 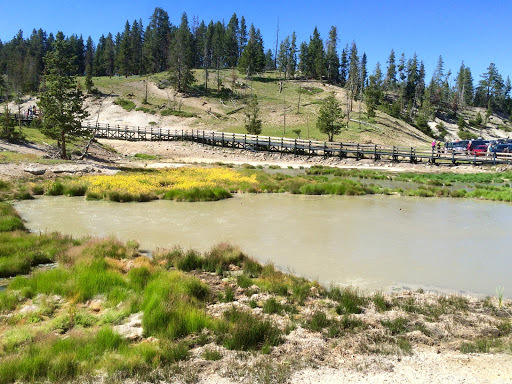 One more stop along the way, half way to Fishing bridge from Canyon Village is Mud Volcano. 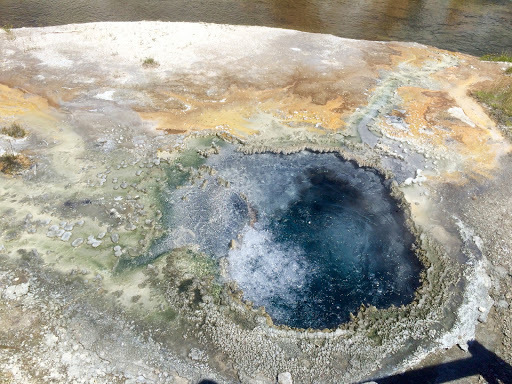 Here is Dragon Mouth Spring, which lashes out water like a dragon’s tongue. 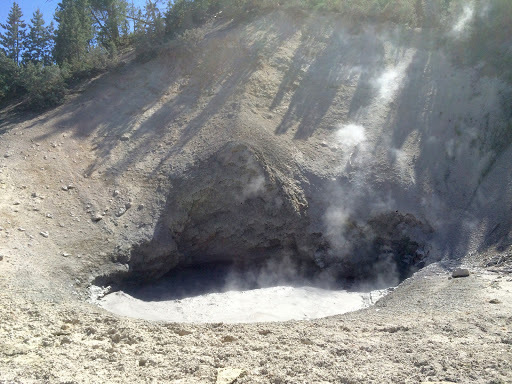 Mud Volcano blew itself apart in 1870, and now bubbles up only mud. Astounding to see the natural wildflowers and grasses that can survive under extremely warm temperatures and chemical conditions.